Last year, I made a heavy chicken and “roasties” dinner that Jan had requested. For this weekday meal I wanted something similar, but much lighter. I am making a spinach and orzo salad, so I wanted just the chicken and the Greek flavors tonight. 2. Place the chicken pieces in the marinade and turn them over several times while the oven is heating up, about 15 minutes. 3. Preheat the oven to 400º F.
4. 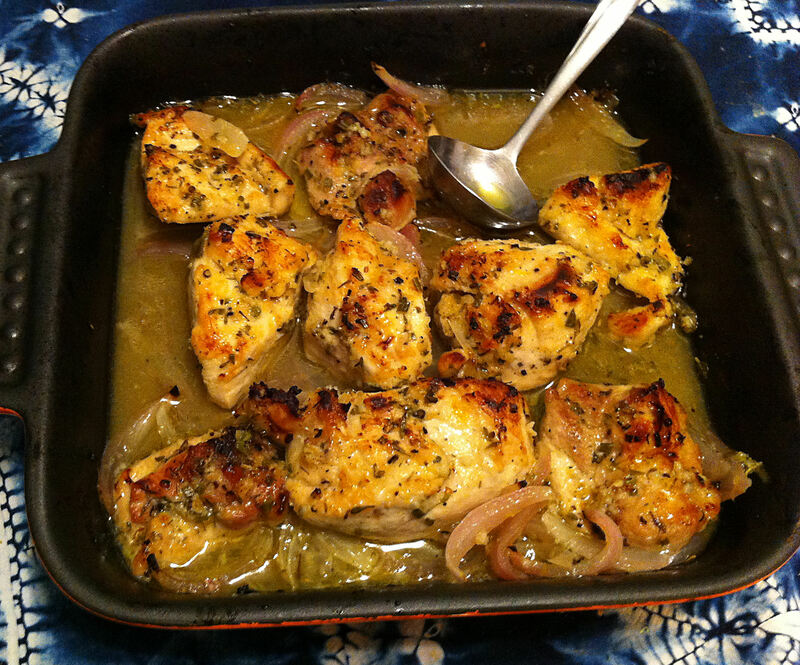 Stack the chicken to one side of the casserole and lay half of the onions in a single layer in the bottom of the pan. Tip: I designed this dish to eliminate unnecessary mixing bowls. 5. Stack the chicken on top of the onions, so that the other half of the casserole is open. 6. Spread the remaining onions in a single layer. 7. Arrange the chicken pieces evenly over the onions. 8. Put the pan in the oven and roast for 15 minutes. 9. Turn the chicken pieces over and spoon the pan sauce over them. 10. Switch the heating element to broil. 11. Broil the chicken until it is cooked through and well browned, but not burnt, about 5-10 minutes. 12. Remove the casserole from the oven and tent it with foil. Tip: Let the chicken rest for 10 minutes to redistribute the juices inside the meat. 13. Toss the onions and chicken in the sauce a final time and garnish with the parsley (optional).